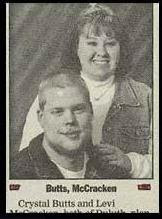 A Mr Butts to marry a Miss McCracken? Surely not. I hope she doesn't take a hyphenated name. Some really weird names get together. I remember seeing on where a girl whose first name is Ebony married a guy whose surname is Ivory. Thats no joke. Well, its funny, but its no joke.